The third is known as the Magnesium Light. It is produced by the combustion of a rod of magnesium, one of the metals discovered in modern times. This metal has so strong an affinity for oxygen, in union with which it forms the substance magnesia, that it is with the utmost difficulty that it can be separated from it and produced in a metallic state. And when it is thus separated, it recombines with it with so much intensity of action as to develop light possessing, even for photographic purposes, almost the power of the sun. It is only with the first of these three, the Electric Light, that we have to do in this article. The forms and methods of arrangement of the apparatus employed for the development of the electric light are infinitely varied; but the essential things are in all cases the same. There must be a battery, or other means, for inducing and maintaining a constant flow of electricity. There must be wires or other conductors leading to the small charcoal cylinders on the termination of which the points are formed for the development of light. There must be an apparatus for moving one of the charcoal cylinders, as required, to keep the distance between the two points the same. To accomplish this last object was for a long time a great difficulty. But without it - that is, without some method of keeping the break in the circuit always the same - the intensity of the light would, of course, constantly vary. And it was necessary, moreover, that the movement should be automatic - that is, that the increasing distance between the points, as the extremities were gradually burned away, should correct itself - and not be dependent on a mechanism controlled by other means. Difficult as it might seem to be to accomplish this end, the above engraving gives, in a simple form, an illustration of the possibility of doing it. The principal involved is that the nearer the charcoal points are to each other the more abundant is the flow of electricity across the interval. Now, the more abundant the flow of electricity along a conducting wire, the more powerful will be the magnetism which it will develop in an iron rod or bar which it is made to encompass. it is obvious that this gives us the power to regulate the distance between the points, by connecting one of them with an electro-magnet, and arranging the apparatus in such a manner that the narrowing of the interval shall increase the power of the electro-magnet, and so allow the point to be brought up nearer by means of a counterpoise. In the engraving we see the lower charcoal cylinder held in an iron tube, which is seen passing into an electro-magnetic coil near the base of the instrument. This tube plays freely up and down within the coil, being in equilibrium between the attractive force exerted by the coil and the weight passing over the coil and acting as a counterpoise. The result of this arrangement is that, on the increase of the distance between the points, the magnetic force, which tends to draw the lower cylinder down, is diminished, and the counterpoise raises it up. But as soon as it approaches the upper point again, the flow of electricity is increased, the electro-magnet receives a fresh accession to its power, and the cylinder is drawn down again. In describing this contrivance, inasmuch as we are obliged to speak of these two forces separately, and to describe the operation of each in its turn, the impression might easily be left on the mind of the reader that the result would be a series of oscillations, which would be anything but indicative of steadiness in the light. But it is found in practice that these forces are so nicely balanced, and each follows so instantaneously in its actions the least deviation in the conditions, that the result is steadily maintained equilibrium. In other words, the mechanism acts, practically, not in bringing the charcoal point back to its place when it gets out of it, but in preventing it from getting out of its place at all. The regulators actually employed are much more complicated than this, but this illustrates the general principles of their action, in the most simple form. The necessity for the constant regulation of the distance of the charcoal points arises from the fact that the action of the current causes a gradual consumption of the substance of the charcoal at the positive pole, occasioned partly by the combustion of it, and partly by the transmission of incandescent particles through the air to the negative pole. The engraving represents the appearance of the points after the process has been for some time continued. The luminous globules seen attached to the cones are the results of the fusion of earthy impurities contained in the charcoal. This gradual wasting of the points, especially of that connected with the positive pole, would gradually increase the distance between them, and so bring the process to an end, were it not for the action of the regulator. To produce this light there must be a constant and powerful electric current, and to induce and sustain this requires the constant expenditure of force in some other form. In the case of an ordinary galvanic battery, the source is supplied by the consumption of the zinc; but, by means of a magneto-electric arrangement - that is, an arrangement for the development of electricity by means of a rapid succession of magnetic changes produced through the revolution of a series of electro-magnets within a system of permanent magnets - the force is supplied by a steam-engine, or by the muscular power of a man; that is, by the consumption of the coal burned to drive the engine, or of the food digested in vital organs to supply the strength to the man. The light can be generated only by the expenditure of an equivalent force in some other form. The above cut reflects one of the forms of the magneto-electric machine, as constructed by a French company called The Alliance a company established for the purpose of perfecting and manufacturing apparatus of this character. It is only a general idea of its form, and of the principle on which it operates, that can be communicated by an engraving. The principle on which it is constructed is this, that when a bar of iron changes its magnetic state, a current of electricity is instituted, during the moment of the change, in a conducting wire passing across the bar at right angles. Thus if a short, round bar of iron is wound with an iron wire, the two ends of the wire being left free, and the coil or bobbin, as the French call it, thus made is brought suddenly up to any strong magnet, an electric current is for the instant induced in the wire, which may be made manifest through proper observations, by means of the two ends. If now the bobbin be as suddenly withdrawn, another current in a contrary direction will be produced in the wire. Of course the actual production of this effect does not depend upon the strength of the magnet, nor upon the suddenness of the approach and withdrawal of the bobbin. These circumstances only affect the result in respect to degree. The magnet must be powerful and the motions rapid to make the effect manifest. The machine, then, is simply a mechanical arrangement for causing a great number of such coils as above described alternately to approach to and recede from the poles of powerful magnets, in very rapid succession. The electric force is so prompt in its action that no possible rapidity of motion that can be given to the bobbins will confuse it or interfere with it sending two distinct currents through the wire in contrary directions, as the bobbins advance or recede. This is wonderful, but it is in harmony with the other wonder somewhat analogous to it, that a telegraphic message may be sent along a wire through this same agency, by means of a series of separate signals following each other in very rapid succession, without confusion, and moving at the rate of many thousands of miles in a second. The machine illustrated in the engraving consists externally of eight ranges of powerful horseshoe magnets arranged around a hollow cylinder, with the poles turned towards the axis of the cylinders. There are seven of these magnets in each range, making fifty-six in all. This whole system is fixed to the frame of the engine so as to be immovable. In the center is a revolving cylinder which nearly fills the opening left between the poles of the magnets, and upon this cylinder are fixed a set of double coils or bobbins, making one hundred and twelve in all. The ends of some of these bobbins are seen in the engraving. The precise arrangement of the mechanism connected with these coils cannot be fully explained. All that is necessary, however, for the reader to understand is that they are so placed that on causing the inner cylinder to revile, the ends of the bars which form the cores of the bobbins are brought in rapid succession into close proximity to the poles of the magnets, alternately approaching to and receding from them with great rapidity. The consequence is that a series of electrical impulses is given in the wires coiled around the bars, each impulse being in the opposite direction from the one preceding it. These currents, almost instantaneous in respect to duration, succeed each other with inconceivable rapidity - the rapidity depending, of course, on the speed of the rotation of the cylinder bearing the bobbins. It is necessary that the speed should be great, for as the light, at the break between the charcoal points, only shines while the current is passing, and, moreover, as it changes its action somewhat according to the direction in which the current flows, it is plain that a slow motion of the coils over the poles of the magnet would produce only a series of flashes, with perceptible intervals between them. it is found that by giving the cylinder a speed sufficient to produce about two hundred electric impulses in a second, the eye can no longer take cognizance of the interruptions, and the result is a uniform and continuous emission of a most intense and brilliant beam. Such a machine may driven by means of any convenient mechanical power. In the engraving it is represented as impelled by a pulley and band from a steam-engine in an adjoining apartment, as shown on the right. On the left is the stand containing the charcoal points, showing the light developed between them, and the apparatus for regulating the distance which separates them below. One of the most curious and striking illustrations of the modern doctrine of the correlation of force is shown in this instrument by the fact that, although the central cylinder, bearing the bobbins, the turning of which seems to be all the work which is required to be done, is so nicely mounted, and on bearings so delicate as apparently to call for the exercise of only a very slight force to make it revolve, namely, that resulting from an almost inappreciable friction, it really requires a two horse-power to work the machine. The resistance come from certain influences of the magnetic and electric agencies in their action upon each other, which influences have to be overcome by force, and this force is precisely that represented by the light developed at the break in the circuit. The machine is thus a contrivance for converting mechanical force into electricity, and then from electricity into light. The intense brilliancy of the electric light, and the extreme concentration of the radiant point, render it remarkably suitable for the microscope and the magic-lantern. The engraving represents the manner of employing it for the microscope. 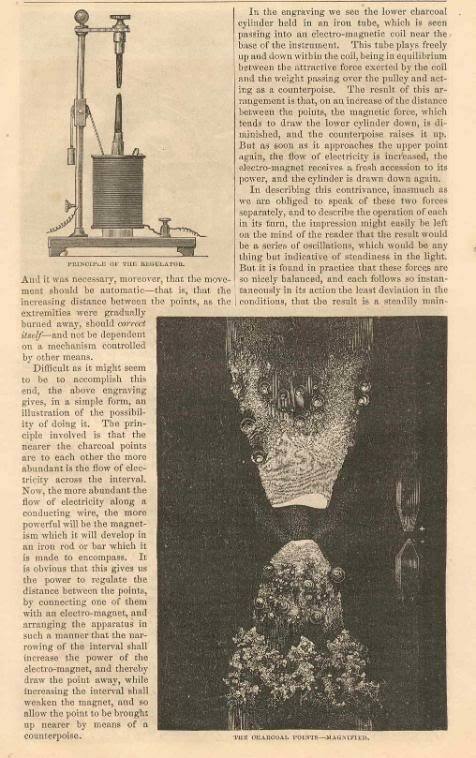 The electricity is produced in this case by a galvanic battery, as shown by the jars on the floor, instead of by a magneto-electric machine - that is to say, the source of the power is the consumption of zinc, and not the consumption of coal. The first attempt to employ the electric light in the construction of public works was in the building of the bridge at Notre Dame, at Paris. The experiment was perfectly successful in enabling the workmen to continue their labors through the night, and in this greatly diminished the time required for the work. This trial was made, however, when the only mode of procuring the necessary electric power was by a battery, and the light was accordingly found to be quite expensive. 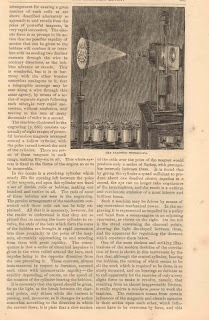 Since then the much more economical mode of employing magneto-electric machines, to be worked by mechanical power, has been discovered, and the emergencies in which this light can be advantageously used are rapidly multiplying. It has been tried in mines, in caverns, on board ships, and in light-houses, and also in the construction of such works on land and in the open air as are of an urgent character requiring night labor. 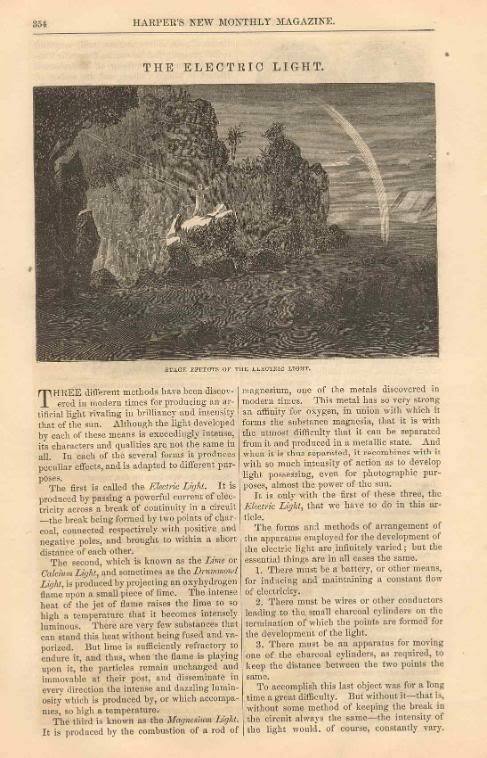 Although the electric light rivals in brilliancy that of the sun, the appearance is very different when employed for purposes of general illumination, on account of the extreme concentration of the radiant point, which makes the contrast of light and shade so sharp and decisive as to produce a peculiar effect. 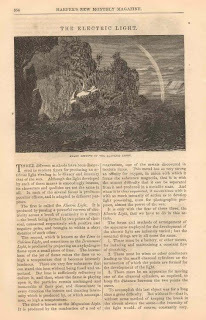 The light of the sun, besides radiating in the first instance from a comparatively wide surface, is greatly diffused in passing, for so great a distance, through the earth's atmosphere. Every minute globule of water which floats in the air, every mote, every particle of dust, every microscopic insect and seed and spore, intercepts a portion of his beams, and becomes a new centre of radiation. The result is general illumination of the whole sky, and a diffusion of the light before it reaches the abode of man, which adapts it far more perfectly to his varying wants. 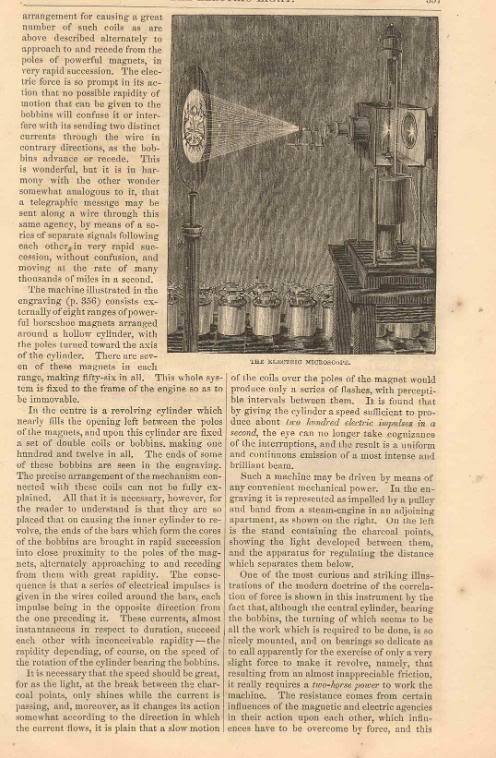 The electric light has already begun to be practically employed, not only for the purposes above referred to, but also for light-houses and signal lights on board ship, for both of which it is admirably adapted on account of its great penetrating power in misty and foggy states of the atmosphere. It is also found to be well fitted for the production of stage effects in operas and theatres. It is used for this purpose in Paris, and to some extent in this country. It has also been employed as a signal light from the mast-head of a ship, in one of the steamers of the French line, and has thus been displayed in New York Harbor, attracting great attention from all who beheld it. The probability is that the employment of it for these and other uses will greatly increase; and it is by no means certain that it may not in the end be found to be the most effective and economical mode of illuminating large public halls. Originally published in Harper's New Monthly Magazine, August 1870.